A long-time ago, there was a wood burdened Donkey lumbering across a stream. He was sick and tired and he couldn´t stop resenting the weight of his burden. “Hi-aaa, Hi-aaa”_ the Donkey brayed. At sunset the Donkey lay down on the fresh grass to rest. But even there, he was moaning with brays. A little Worm, being fed up with the Donkey’s moans, came crawling to him. “Don´t resent your fate so much. I would like to walk, jump, cross the streams but nevertheless my life consists of crawling and running the risk of being trampled and mashed. 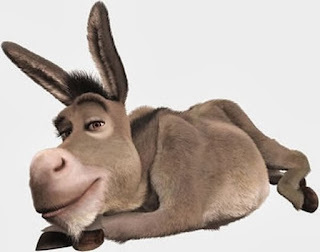 “Dear fellow, it´s hard to live with all these burdens everyday”_ claimed the Donkey. “We must learn to take our fate with happiness and optimism; if not we will be miserable all our lives”_ replied the Worm. Why are you crushed down, O my soul? And why are you troubled in me? Put your hope in God; for I will again give him praise who is my help and my God.